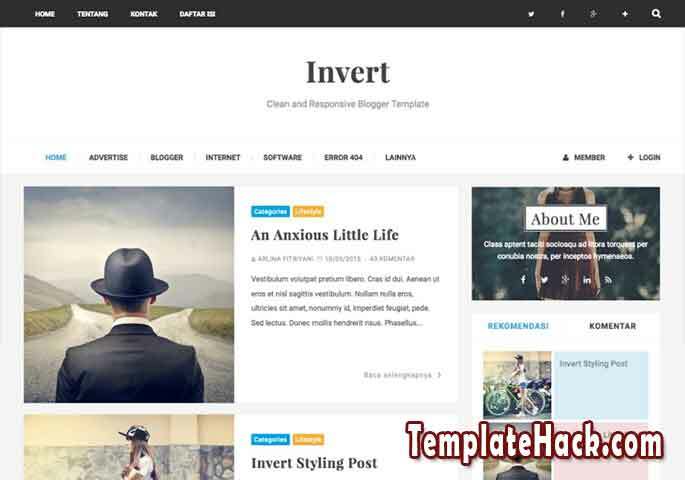 TemplateHack.com - Download Invert premium blogger template. Invert is another version of Invert Grid Blogger Template. On this version, Invert made simplify by remove non usable widget. Invert has tabbed widget to reduce your blog widget section and make your blog look cool. Invert has black base color and multicolors on widget selecting on every post. It is also has great SEO ready features to make your blog can compete with other same niche blog topic on Google, Bing, and Yahoo search engine. About Me, Ads Ready, Breadcrumbs, Browser Compatibility, Customizable, Drop Down Menu, Email Subscription Widget Ready, Fast Loading, High CTR, HTML5 Valid, Mobile Friendly, Page Navigation Menu, Post Thumbnails, Responsive, Search Box Button, SEO Friendly, Social Bookmark Ready, Social Share Button, Stylish, Tabbed Widget, Whatsapp Sharing Button, Clean, 1 Right Sidebar, Black, White, Multicolors, 2 Columns, 1 Column Footer. Gadget blogger template, Games blogger template, Magazine blogger template, Mansory blogger template, News blogger template, Newspaper blogger template, OOTD blogger template, Portal blogger template, Reviews blogger template, Sports blogger template, Tech blogger template, Technology blogger template, Video blogger template.